BAKERSFIELD, CA. — A new app called BeeWhere will help increase communication between beekeepers and pest control sprayers. In the past, these two groups have had a difficult time communicating but the local agriculture commission is looking to change that. “We’ve been looking for a long time for some type of a tool that would make it easier for the beekeeper to register and the primary reason is because we want as an ag community to protect bees because agriculture relies on the bees," said Glenn Fankhauser, Kern County Agriculture Commissioner. 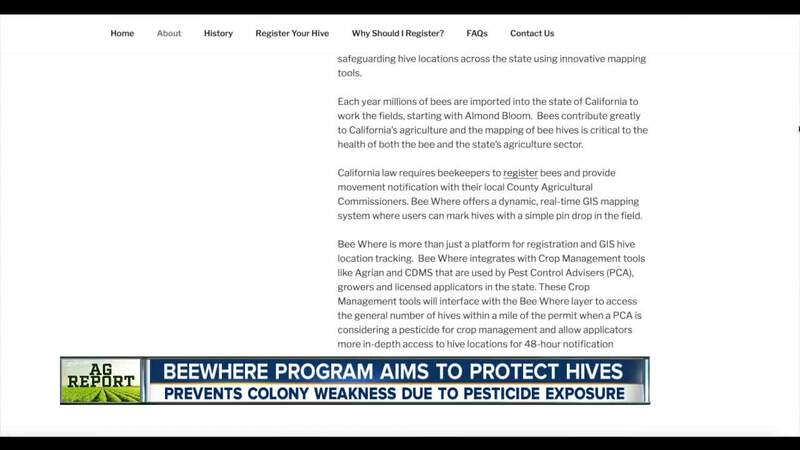 The BeeWhere program is a collaborative initiative between multiple agriculture agencies in Kern County. The app allows local and out-of-state beekeepers to pin point where they will have their bees. This way, pest control can communicate with the beekeepers in advance. Each year, millions of bees are imported to California to work the fields starting with the almond bloom and beekeepers say this technology is critical for a healthy start to the season. “Almonds are probably the largest pollination event in the world so the beekeepers wanna be a part of that. Why do they wanna keep their bees healthy? Because this is the start of the year. Every crop they go to anything they do the rest of the year depends on how they come out of this healthy," said Gordon Wardell. After nine months, the app is expected to up and running in February. “We’re hoping that its going to be rolled out soon," said Fankhauser. "We were hoping to have it at the beginning of the nut season this year, but were hoping February should be the target date."